Protein blend (pea protein isolate, potato protein, chlorella protein, taurine), organic cane sugar, fiber blend (inulin [from chicory], bamboo fiber, pea fiber, flax seed powder, apple fiber), sunflower oil, natural flavors, medium chain triglycerides, cocoa powder, vitamin mineral blend (potassium citrate, sodium citrate, sodium chloride, sodium ascorbate, ferrous fumerate, d-alpha-tocopheryl acetate, sodium selenate, biotin, niacinamide, vitamin A palmitate, zinc oxide, vitamin D2, copper gluconate, calcium D-pantothenate, manganese sulfate, folic acid, potassium iodide, pyridoxine hydrochloride, cyanocobalamin, riboflavin, thiamine hydrochloride, sodium molybdate, chromium chloride), green coffee bean extract, stevia extract, xanthan gum, whole food complex (freeze dried apricot, freeze dried mango, drum dried raspberry, dehydrated carrot powder, freeze dried pineapple, dehydrated brocooli, dehydrated cabbage, dehydrated beet, dehydrated spinach, orange juice powder), aminogen®, bacillus coagulans. Protein blend (bee protein isolate, potato protein, chlorella protein, taurine), organic cane sugar, fiber blend (inulin [from chicory], bamboo fiber, pea fiber, flax seed powder, apple fiber), sunflower oil, natural flavors, medium chain triglycerides, cocoa powder, vitamin mineral blend (potassium citrate, sodium citrate, sodium chloride, sodium ascorbate, ferrous fumerate, d-alpha-tocopheryl acetate, sodium selenate, biotin, niacinamide, vitamin A palmitate, zinc oxide, vitamin D2, copper gluconate, calcium D-pantothenate, manganese sulfate, folic acid, potassium iodide, pyridoxine hydrochloride, cyanocobalamin, riboflavin, thiamine hydrochloride, sodium molybdate, chromium chloride), green coffee bean extract, stevia extract, xanthan gum, whole food complex (freeze dried apricot, freeze dried mango, drum dried raspberry, dehydrated carrot powder, freeze dried pineapple, dehydrated brocooli, dehydrated cabbage, dehydrated beet, dehydrated spinach, orange juice powder), aminogen®, bacillus coagulans. 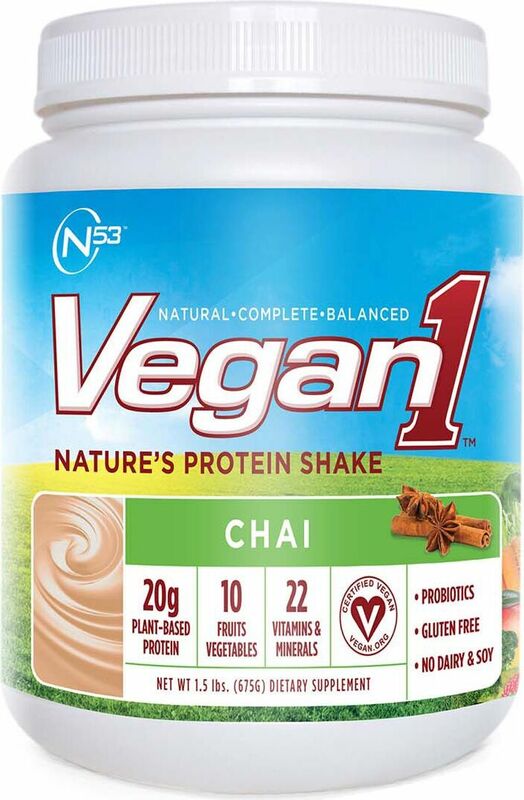 All these nutritional components blended into one easy-to-mix powder makes Vegan1 the ideal complement for any day. 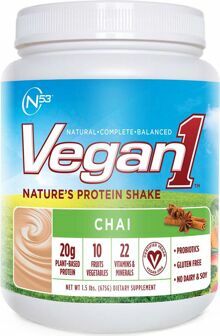 So whether you're a vegan, a health enthusiast, or just looking for a healthy protein smoothie, satisfy your additional nutritional needs with Vegan1, Nature's Protein Shake. Blender: Combine 2 scoops of Vegan1 with 6-8 ounces of cold water and 8 ice cubes. Blend for 1 minute. Enjoy! Shaker: Combine 2 scoops of Vegan1 with 8-10 ounces of cold water and 4 ice cubes. Shake for 1 minute. Enjoy! Glass: Combine 2 scoops of Vegan1 in a glass with 8 ounces of water. Stir vigorously. Then add 4 ice cubes and stir. Enjoy!